Chile's capital is the fifth most populous city in South America, after São Paulo, Buenos Aires, Rio de Janeiro and Bogotá. Most of the metropolitan area is flat, but the Andes begin in the eastern suburbs, which are about 40 kilometers (by air) from the Argentine border. Santiago had South America's first horsedrawn street railway in 1858 and one of its largest electric tramway systems between 1900 and 1965 [see Santiago chapter of The Tramways of Chile]. It had three trolleybus eras: an experimental line in 1940, a large system with 200 vehicles between 1947 and 1978, and a new 7 km line with 32 trolleybuses from 1991 to 1994. The first two periods are discussed in Part A. 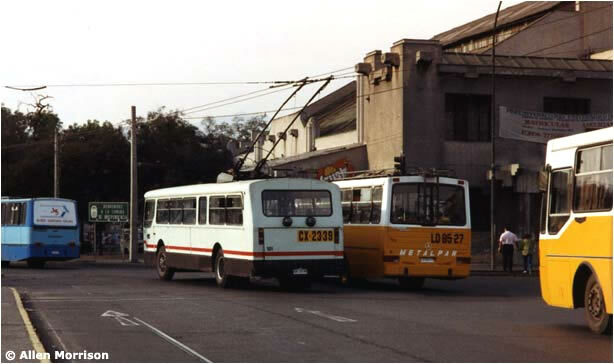 After the Santiago trolleybus system closed in 1978, the Empresa de Transportes Colectivos del Estado transferred its remaining vehicles and equipment to its system in Valparaíso. The Valparaíso system, in turn, ceased operation on 30 November 1981 and the government agency was dissolved. 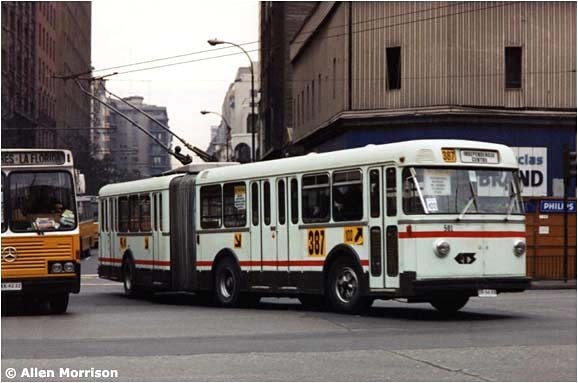 On 26 April 1982 a group of Valparaíso businessmen acquired the assets of the former ETCE – vehicles, infrastructure, operating rights – and formed a new company, Empresa de Transportes Colectivos Eléctricos. 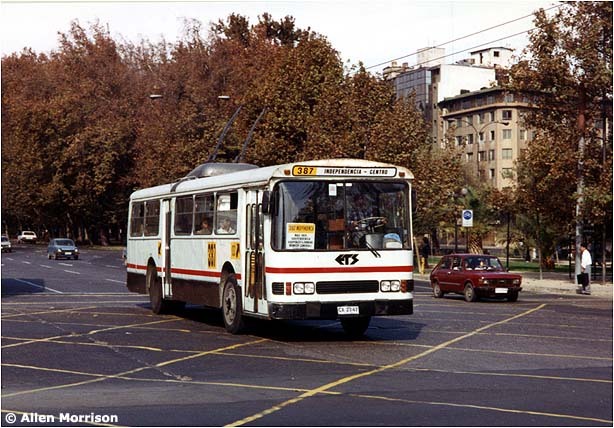 A new trolleybus era in Chile had begun. Since ETS was a subsidiary of ETCE in Valparaíso, vehicles were occasionally transferred between the two systems. 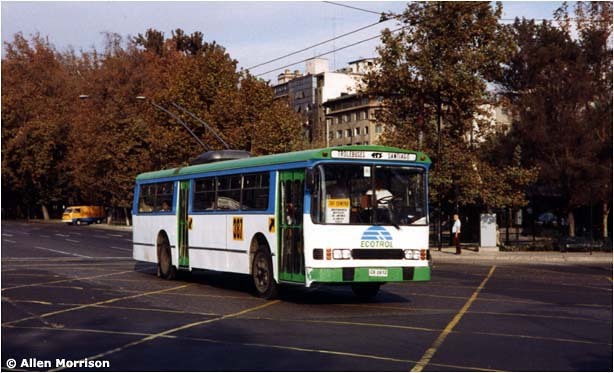 Trolleybus 146 from St. Gallen and at least five trolleybuses from Genève, #32, 96, 99, 617 and 643, came to Santiago in the following years. On 12 July 1993 ETS discontinued revenue service along Av. Hipódromo Chile and extended its wire on Av. Independencia 3.2 km north to Calle Nueva Los Zapadores [see map]. 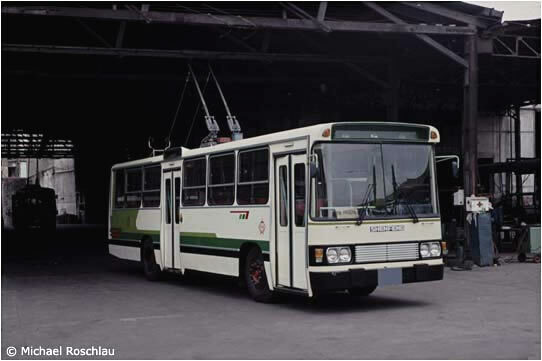 ETS had a franchise to build another trolleybus line along Av. Irarrázaval to Plaza Egaña, which would have duplicated one of the original trolleybus routes of 1947-1978 [see map]. 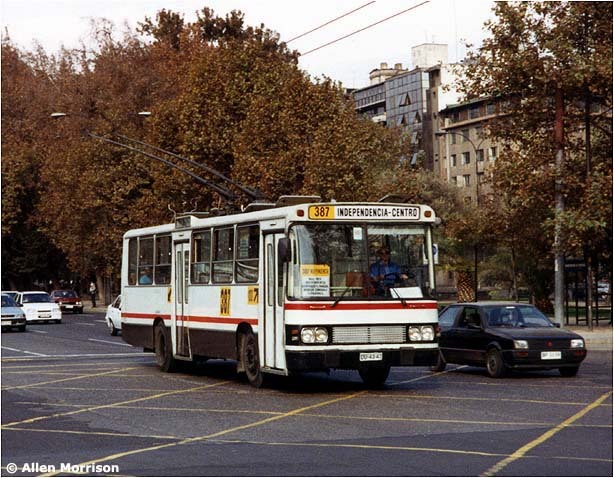 In March 1992 a new company, Empresa Nacional de Transporte de Pasajeros, announced that it had purchased 50 trolleybuses in Russia for 10 new trolleybus routes in Santiago. 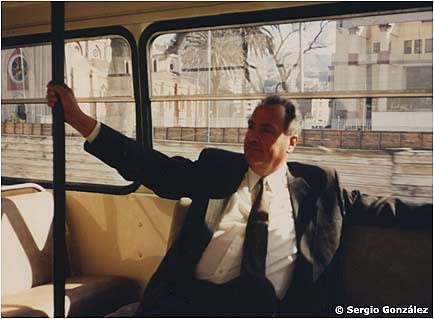 In 1998 Mayor Jaime Ravinet renewed the plan for a trolleybus line to Las Condes and promoted other lines west to Quinta Normal and north to Huechuraba. 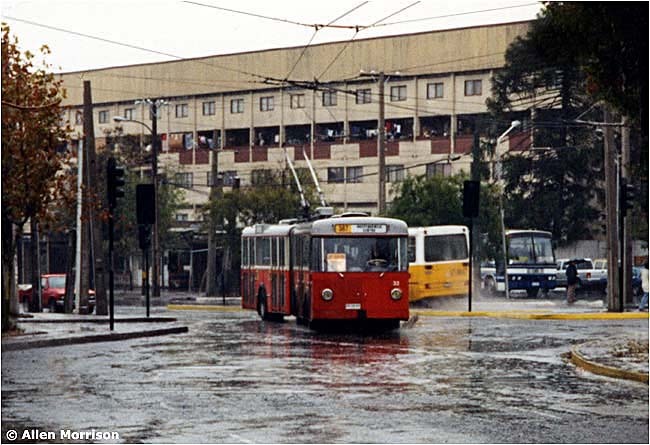 In 2001 Metro de Santiago proposed the construction of new trolleybus routes to feed its new underground line on the north side: trolleybuses would run again on Avenidas Independencia and Av. Recoleta . . .
None of these lines was built. The Russian trolleybuses never arrived. But Santiago seems never to stop trying to build trolleybus lines. Perhaps the famous line in nearby Valparaíso, which celebrated 50 years of operation in 2003 and is now a Monumento Nacional, reminds Santiaguinos that they are missing a good thing. "Proyectan Retorno de Trolebuses" in El País (Santiago), 21/6/1987. 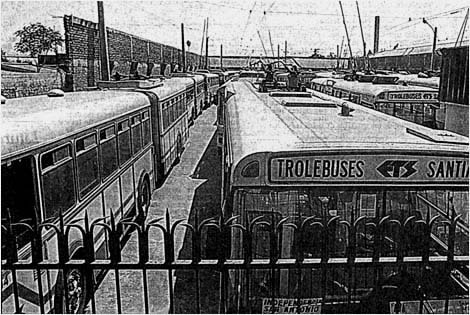 Long article about trolleybuses with description of proposals, including a line to Las Condes. Photograph of remodeled Pullman 821 in Valparaíso. "Cinco milliones de dólares costará reponer los troles en Santiago" in El Mercurio (Santiago), 7/7/1987. The reconstruction project in Valparaíso. Plans for Santiago. Large picture of Pullman 804. 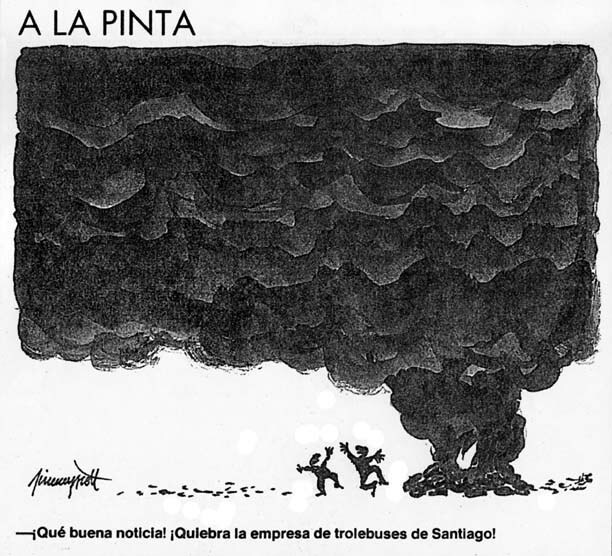 "Trolebuses: Aliados contra la contaminación" in La Época (Santiago), 16/8/1987, pp. 15-19. Impressive magazine-style article about trolleybuses as weapons again air pollution. Good general trolleybus survey, history of ETCE transformation. 12 color photographs! "Trolebuses no dejarán Valparaíso" in El Mercurio (Valparaíso), 10/7/1987. Reconstruction of 15 trolleybuses for the new line in Santiago. Assurances that trolleys will continue to run in Valparaíso. "De los caballos a los trolebuses" in El Mercurio (Valparaíso), 3/12/1987. General trolleybus history and plans to install them in "otros puntos del país" (other parts of the country), including Santiago. "Trolebuses De Regreso" in El Mercurio (Santiago), 5/12/1987. Details of the new line planned in Las Condes. "Santiago: S.A. mixta para retorno de trolebuses" in El Mercurio (Valparaíso), 4/8/1989. Formation of new company to import trolleybuses and operate them in Santiago. 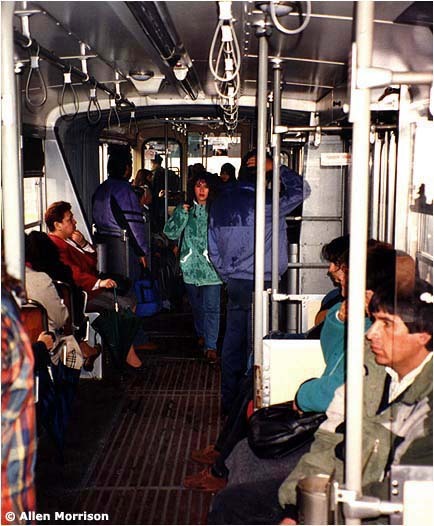 "Viejo trolley" in Hoy (Santiago), 11/3/1990. New trolleybus line will begin operation in July  between Estación Mapocho and Plaza Chacabuco. Most of the vehicles will be supplied by Norinco of China. 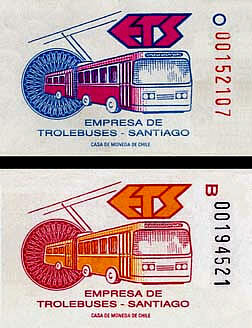 "En septiembre retornan trolebuses a Santiago" in El Mercuro (Santiago), 14/3/1991. New trolleybus line on Av. Independencia will begin operation in September . "4 millones de dólares cuesta la extensión de la ETC en Santiago" in El Mercurio (Valparaíso), 16/3/1991. Director Pedro Massai assures that the new Santiago project will not affect trolleybus operation in Valparaíso. Notes friction with bus company owners who do not want trolleybuses to run in Santiago. 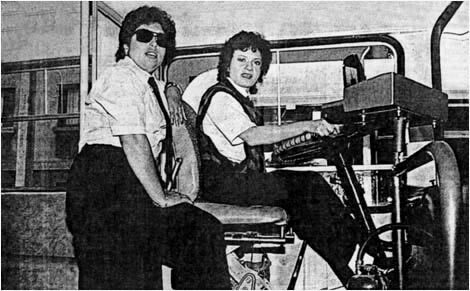 "La Vuelta del Trolley" in El Mercurio (Santiago), 16(?)/6/1991. Sunday supplement about the return of trolleybuses to the capital. Six large photographs of trams and trolleybuses. "El Viernes Se Inaugura Recorrido de Trolebuses" in El Mercurio (Santiago), 5/12/1991. Next Friday the Minister of Transport will inaugurate the new trolleybus line between Plaza Chacabuco and Av. Bernardo O'Higgins. Details of the operation and plans for future lines. 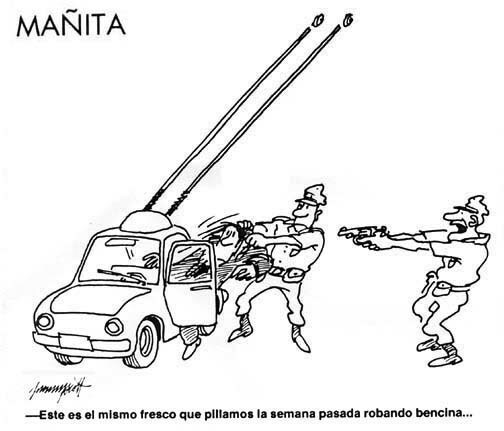 "Postergan Puesta en March de Trolebuses" in El Mercurio (Santiago), 6/12/1991. Subsecretary of Transport delays the inauguration of trolleybus line because, he says, a law forbids the operation of old buses in the city. Perhaps it can open when the Shenfengs arrive from China. "En Cuarentena Barco que Trae Los Trolebuses" in El Mercurio (Valparaíso), 8/12/1991. The eight Chinese trolleybuses are stranded in Caldera because their ship is infected with boll weevils . 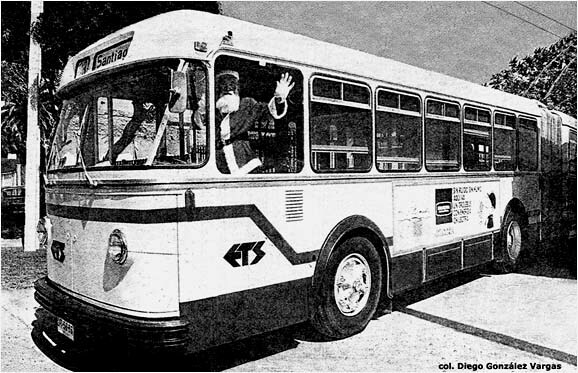 . .
"Llegará una nueva partida de trolebuses de China Popular" in El Mercurio (Valparaíso), 19/12/1991. The ship carrying the eight Norinco trolleybuses has arrived in San Antonio and will be unloaded today. "Correa llamó a no boicotear troles" in El Mercurio (Santiago), 25/12/1991. The transport minister asks the owners of the gas bus companies not to interfere with the operation of the new trolleybus line. "Estreno con Aplausos" in El Mercurio (Santiago), 29/12/1991. Three Swiss trolleybuses, two of them driven by women, inaugurate the new line on Christmas Eve. Chinese "Shenseny" trolleybuses also took part. The new installation cost $4.5 million. "Trolebuses son novedad del año" in La Tercera (Santiago), 30/12/1991. Large crowds ride the trolleybuses during the Christmas holidays. Two nice photographs. "Nos Vamos por el Alambre" in El Mercurio (Santiago), 12/1/1992. "We're Going by the Wire." Two-page article about the first two weeks of operation. Interviews with passengers and the women drivers. Four large pictures. "Se restauraron en Valparaíso: Tradicionales troles tienen positiva acogida en Santiago" in El Mercurio (Valparaíso), 2/2/1992. ETCE has finished sending its vehicles to the capital, says that trolleybuses could run in other cities. "Partida llega en próximos 90 días. Compran trolebuses rusos" in El Mercurio (Santiago), 19/3/1992. First of several (false) reports about the purchase of 50 trolleybuses in Russia. "Entrarián en Operación a Fines de Año: 50 Trolebuses Rusos Inician Sus Recorridos por Diversas Comunas" in El Mercurio (Santiago), 6/8/1992. 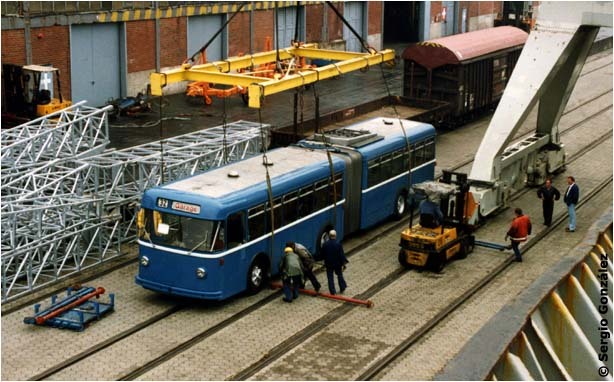 The new Empresa Nacional de Transporte de Pasajeros announces that 50 trolleybuses are being loaded onto a ship in Russia and 8 to 10 new trolleybus lines will run in Santiago by 1993. "Huelga legal en servicio de trolebuses" in El Mercurio (Santiago), 29/3/1993. Picture and brief description of the workers' strike. "Deudas Terminaron con Trolebuses en Santiago" in El Mercurio (Santiago), 16/7/1994, p. C-7. Long description of the ETS failure. Statement by Pedro Massai. Government did not support $5 million investment. Gas buses were not supposed to use Av. Independencia. Deliberate collisions with the trolleybuses. Cables cut. "Una opción diferente" in El Mercurio (Valparaíso), 14/8/1994. Newspaper editorial laments the failure of the Santiago project, caused by economic problems, government indifference and "gasoline bus owners who resorted to conduct at odds with healthy competition." "Trolebuses: nuevos intentos en la ciudad" in La Tercera (Santiago), 19/8/1998. Plans for trolleybus lines in Las Condes and Huechuraba, a district north of the city [see map]. "Ciclovías y troles en Santiago Poniente" in La Tercera (Santiago), 20/8/1998. A new transport system – probably with trolleybuses – will begin operation next March. "Trolebuses reaparecerán en Santiago Poniente" in La Tercera (Santiago), 20/8/1998. Santiago's mayor says that trolleybuses will run in reserved lanes on the city's west side. This page is dedicated to the memory of Sergio González Pavesio of Viña del Mar, who among many favors supplied the articles above. The author would also like to thank the following persons for their assistance: Raúl Moroni, Sebastián López and Diego and Mario González Vargas in Santiago; Pablo Serra in Los Andes; Álvaro Rojas Reyes in Valparaíso; and Steve Morgan in Portland, Oregon, USA.